My kids have been obsessed with Pokemon lately (it’s always something), and Evan decided that he wanted a Pokemon birthday party. This year was especially exciting because Evan got to have his very first friend party! Normally, I just go the lazy route and send a Facebook invite, but inviting his friends from school and such required some old-school paper invites. 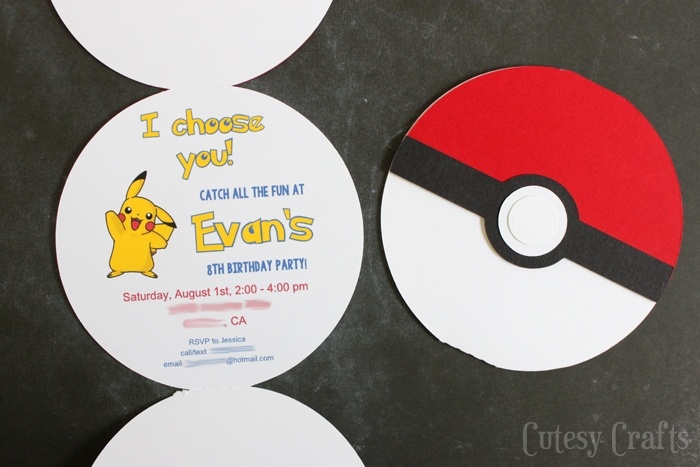 I needed to make them cutesy and crafty, of course, so I used my Silhouette to help me make these Pokeball invitations. I think I finally understand the paper crafters of the world a little more. They turned out SO cute!!! If you don’t have a Silhouette, don’t worry. I’ve also provided a printable version that you can cut with plain old scissors! Not much of a tutorial to post today, but I have free files for the Silhouette and a regular printable pdf. To get access to the free Pokeball invitation downloads, enter your information in the form below or click here to subscribe to my newsletter. It’s free, and I’ll keep your email address safe. You can also unsubscribe at any time. If you would like some printable Pokemon Valentines that look the same, click here. There are two Silhouette files. The inside is a print-and-cut that should be done on white cardstock. The outside file contains the red and black pieces to cut. If you want your invites to look like mine, you will need to download and install this Pokemon font that comes with an outline and inside of the letters. You need to overlap them after typing. If you are printing, there are three pdf files to download. I did my best to transfer these from the Silhouette software that I designed them in. I’m not 100% sure how they will look printed, so do a test print before you start. If anything, the outlines can at least be used for a template to cut the ball out. I split the files into pages to print on white, red, and black cardstock. You might be able to see the lines printed on the black, but you might not. If not, just print on white, and use as a template. I provided lines to write the information like name and address, or you can right click in Adobe Reader and select “add text or signature” to type some text. 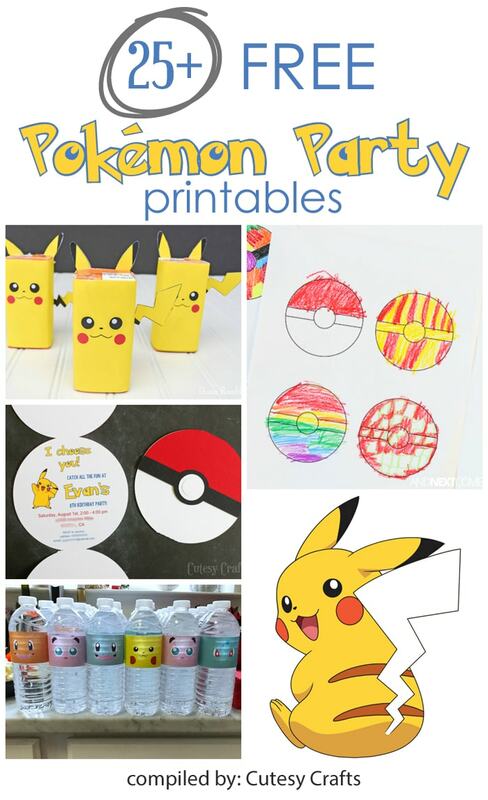 Click here for more free Pokemon party printables. 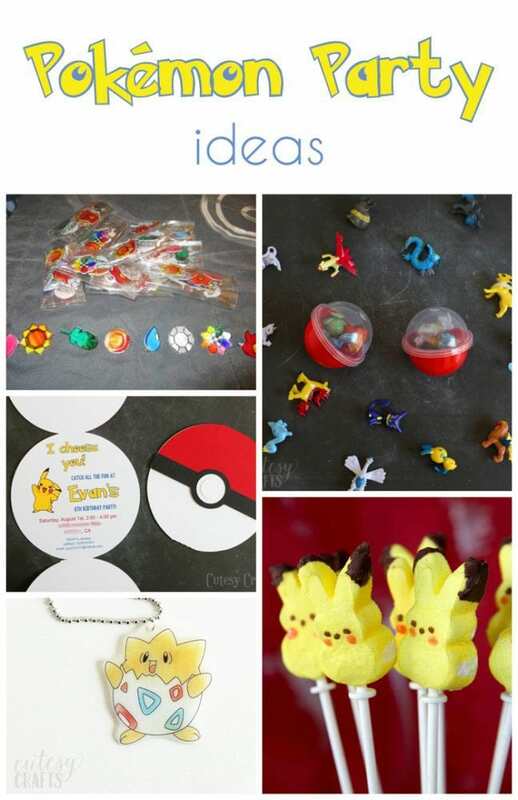 And take a look at these other great Pokemon Party Ideas! 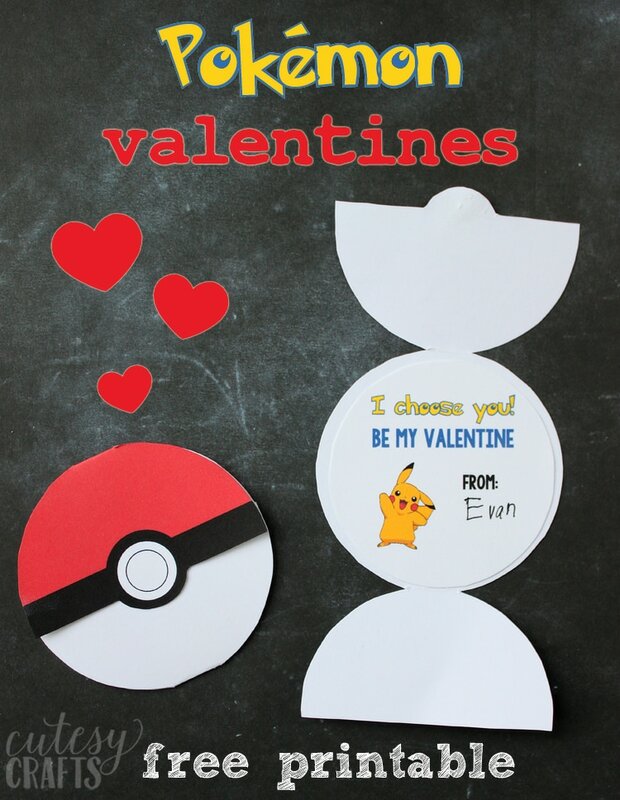 Get some free printable Pokemon valentines too. Thank you so much for these! 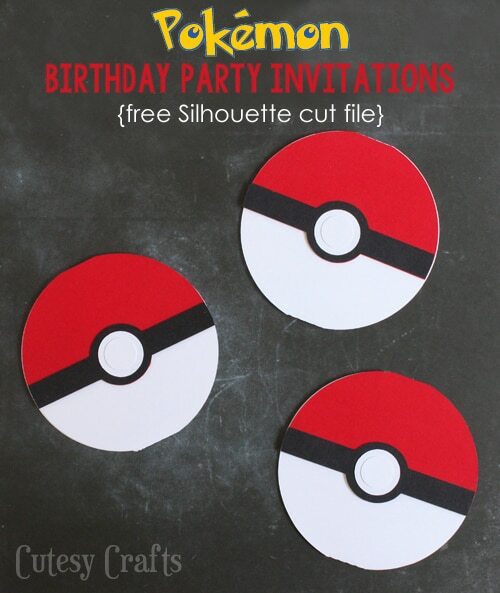 My son and daughter both want a Pokemon party and these invites are PERFECT! So kind of you to share!!!!! Thanks so much!!!!! You’re welcome! Glad you like them! You’re welcome! So glad you could use it! What is the other font you use? It’s called KG Let Her Go – solid. It’s also on Dafont. I absolutely love everything about your party invitations. My son wants to have a Pokemon themed birthday party. I found these invitations and fell in love. I was trying to use your file but I have no luck in importing it into my Cricut machine. Is it posible for you to save these files in an svg format so I can import them and cut them out? Thanks for all the great ideas. I love them. I’m trying to figure out how for you. I will let you know if I do. I designed the in Silhouette studio, and there’s no way to save the directly as an svg in there, but I will keep looking around. Maybe you can use the PDF files to do it somehow? I stumbled across a Silhoutte tutorial on how to save them in svg format. I have also seen other bloggers say how to save them by using another program like inkscape – http://www.inkscape.org. 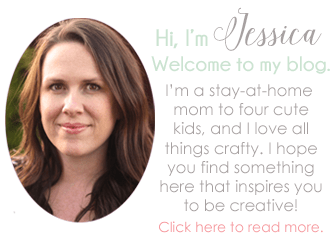 Here is the other bloggers how-to site. I thought I can do the same thing with cricut designspace. I hope this helps you as much as it’s help me. Can you give me the dimensions of your invitation? This might help as well. They are about 9.8 by 4.5 inches. Thank you so much! I was able to recreate this in design space. Thank you so very much for sharing your awesomeness. THANK YOU, THANK YOU!!! My son loves Pokemon and wanted a Pokemon theme party this year. Your invitation template and font link made the custom birthday invitation an easy task for me. Thank you for sharing your creativity. You are so welcome! I’m glad they worked for you! i absolutely love them, but i am completely adobe anything illiterate and can’t seem to make my blue font look as bold as what you did in this. any tips? Are you using the same font? It’s called KG Let Her Go Solid on Dafont.com. I used the Pokemon hollow and solid font on the link younprovided. Oh, you mean that part. 🙂 Maybe make sure that the outline part (hollow) is on top of the solid. Also, they need to be perfectly aligned. If that still doesn’t work, maybe you can try making the outline font a little bigger? Hope that helps! Can’t seem to get my Pokémon hollow and solid to line up exactly or make it bigger than a size 24 font, Advice on how to accomplish the clean look you have. I used my program’s align features to center it automatically. Not sure what program you are using, but there should be some kind of “align” controls you can use. I’m trying to “DIY” my son’s Pokemon party as much as possible, and these invitations are perfect! I just printed them out, along with the pin the tail on Pikachu. Thank you so much for sharing these templates!! Next up, attempting to make a pokeball pinata….. So glad you are able to use them! Ooh a DIY pinata sounds fun! I can’t seem to download the invitation, in spite of subscribing. My email is yourface31@yahoo.com. Thank you. i havent recieved any emails from you containing the invitatioin but i subscribed? am i missing something? katrinabarnes3@yahoo.com , my son is going to be so excited!! I just checked and it looks like your subscription is unconfirmed. You should have gotten an email from me with a link to confirm your subscription. Maybe check your spam folder? Once you click that link, you will get another email with a link to the downloads. Let me know if you can’t find the email, and I can see if I can manually confirm it. darn I don’t see it at all! can you send it again? Do you make these and sell them? I don’t, sorry. You might be able to find something similar on Etsy though. Hi, I cant download the invitation although I have subscribed. Please help! I see you haven’t confirmed your subscription. You should have gotten an email with a confirmation link to click. Then you’ll get a link to the file. Send me an email at cutesycrafts@hotmail.com if you need help with the process. THANK YOU for providing such a great template!!! Such a great idea! I’m so glad the template worked out for you!